I am proud to announce the launch of the new website www.histories-mysteries.com. It is intended to become a central point of contact, to be used by authors and researchers in the field of "alternative sciences" who want to announce their discoveries to the world. The director of this remarkable initiative is Philip Coppens. Philip Coppens is an author and investigative journalist, ranging from the world of politics to ancient history and mystery. He is the editor-in-chief of the Dutch magazine Frontier, as well as a frequent contributor to Nexus Magazine and New Dawn Magazine. Since 1995 he has lectured extensively around the world. He is the author of The Stone Puzzle of Rosslyn Chapel, The Canopus Revelation, Land of the Gods, The New Pyramid Age and Servants of the Grail. I like The Canopus Revelation very much and I think that all his work about the pyramids all around the world is fantastic! I invite you to visit his website: www.philipcoppens.com and to learn about his investigations. Jan Peter de Jong worked for several years as an engineer in Ecuador and Peru, where he met the extraordinary Alfredo Gamarra and heard about his theory. 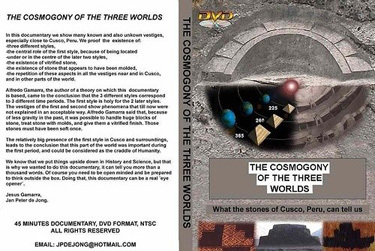 His son Jesus Gamarra asked him to make a documentary in memory of his father presenting this theory, which explains the legacy of the ancient Incas in relation to other sacred places on Earth and to Egypt. I met Jan Peter in Amsterdam and our discussion was fascinating. His work is quite remarkable and I can only recommend this documentary with the beautiful photo that explains the Peruvian scientist's theory: fascinating! His site www.ancient-mysteries-explained.com. This book was written by Giancarlo Barbadoro and Rosalba Nattero with the cooperation of Cassadore Ola, Leader of the Apache Survival Coalition, to bear witness to the historic and significant moral role played by the spirituality of the indigenous peoples of the whole world. "I am pleased to welcome this excellent book that argues the need to protect the sacred lands of indigenous peoples who are still being violated and invaded in this new millennium. Every people has the right to recognition of its own identity and culture in addition to the right to practice their own spiritual beliefs. It is hoped that the revelation of the threat that hangs over Mount Graham, the sacred mountain of the Apaches, will raise public awareness and inspire concrete action." I am very pleased to announce my partnership with this new association I have founded, which is aiming high. The team has understood my message: we need a worldwide overview, more cooperation between disciplines in researching very early technologies, as well as a better comprehension of ancient civilizations, who were without doubt much more advanced than we believe. Indeed, engineers, builders and scientists are often more able to understand and demonstrate the purpose of discoveries made during archaeological excavations, or the purpose of a site, simply through accurate observation. The well informed website of the Russian Maxim Yakovenko from Vladivostok. Maxim is also an expert on megalithic buildings and on Chinese pyramids. My career began with mechanical engineering in the fields of mechanical drafting, motor mechanics, diesel fitting, mechanical fitting and coal fired power-station operations. In my area globalisation halved the workforce and introduced 12-hour shift-work and left me wondering how to continue with life. Ancient history has always interested me so I undertook university studies in 2006 with the aim of becoming a history teacher. In the second semester a research essay question asked "How were the Pyramids of the Old and Middle Kingdoms constructed?" The university study manual was biased toward various ramp theories, none of which looked feasible, so I asked the professor if any other ideas would be acceptable. His reply was positive, so long as substantial evidence was provided. So I spent weeks of tiring hard work on this research. I found references to the "Petrie rockers" and on a doodling pad I had drawn some Pyramid steps. I sketched a square Pyramid block with "Petrie rockers" surrounding the block, which produces four lobes. Something caused me to redraw the block and "rockers" onto a Pyramid step, and in an instant the answer to the puzzle of the Giza Pyramid construction was made apparent to me. "Petrie rockers" have been considered "of unknown use" since they were found by Flinders Petrie in 1895 at Deir el Bahri within the foundation deposits of Pharaoh Hatshepsut's Temple. The "rockers" were found in a covered hewn out rock pit containing models of building tools and equipment. Petrie suspected the "rockers" had been used to raise the Pyramid blocks with a side to side rocking motion, hence their name "Petrie rockers". On 27 August 2006, an ancient Egyptian pulley was re-discovered, a pulley of a design hitherto unknown and unlike any pulley used in the modern world. A model was made to study exactly how this pulley would operate on the Pyramid steps. A single "Petrie rocker" is a quarter component of the ancient Egyptian pulley and termed a "pinion-pulley lobe quadrant". Four lobe quadrants are fitted around one Pyramid block. When fitted, the cross-pegs form a rope-drum. The inner rope going to the pulley is the feed rope and is wrapped at least once around the drum to distribute the load evenly onto all 28 cross-pegs, as shown above. The outer rope becomes the hoist rope and it is this rope only which operates the pulley, causing the pulley to rotate and make positive engagement with the Pyramid steps. When this happens the pulley can lift a 2500kg Pyramid block with a mechanical advantage of 2.8 (which is equivalent to a lifting effort of 90kg) onto the next Pyramid step, a practical technique that makes use of intelligent and innovative ancient knowledge. This is the ancient method for the construction of the Giza Pyramid, which was first used to construct Pharaoh Sneferu's Red Pyramid at Dashur and is the earliest known use of rack and pinion mechanics. The complete theory is fully explained in my book Raising Stone 1: Racks & Pinions Theory, ISBN 9780646476797. This book is available worldwide via www.haitheory.com.